The Run Around is an occasional column listing outdoor or overlooked pleasures that are just too good not to mention. To have your environment friendly, family fun or fine arts event listed, leave your info in the comment section at the bottom of this post. We’ll get back to you, if we’re not out running around! May 14-16 Spend the weekend in Mendocino County’s beautiful Anderson Valley to celebrate the richness and diversity of Anderson Valley Pinot Noir. Enjoy world-class wines and food, along with engaging local artists and entertainers. Tickets are sold exclusively online at http://www.avwines.com/ (no tickets available at the door). $10 early purchase discount, which expires on May 1. No charge for open house events on Sunday, May 16. This event sells out! 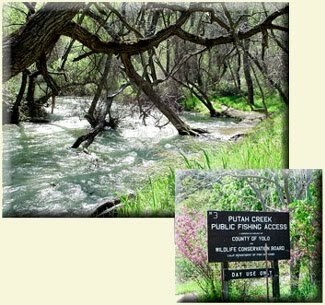 The Putah Creek Council offers a new educational series that explores the people and places that make Yolo County’s Putah Creek special. •May 2, 9 a.m. to noon, Hike and Brunch at Bobcat Ranch – led by Ranch Manager Alex Palmerlee: $35 per person for members; and $40 perperson for non-members. •May 8,9-noon, Yolo Bypass Wildlife Area Tour – led by Manager Dave Feliz members $30 per person; $35 per person for non-members. May 9, 10 a.m. to 4 p.m. at South Coast Winery in Riverside County’s Temecula Valley Enjoy an elegant champagne brunch with carving stations and a children’s buffet. Call 951-587-9463. Ext. 7237 for reservations. Resort info online at: www.wineresort.com. Check out the Temecula Valley Winegrowers Association online at: http://www.temeculawines.org/.